Found the problem? Well, the thing is that this project will compile, assemle and link just fine. But it won’t actually use my code in startup.s! This can be easily verified with adding some garbage into startup.s: that file will not be assembled and won’t be part of the build. Similar as it would be a text file: it is simply not included as source file into the CDT build! So what is wrong with it? It is the extension of the file: it is *.s (lower case ‘S’) and not *.S (upper case ‘S’) :-(. 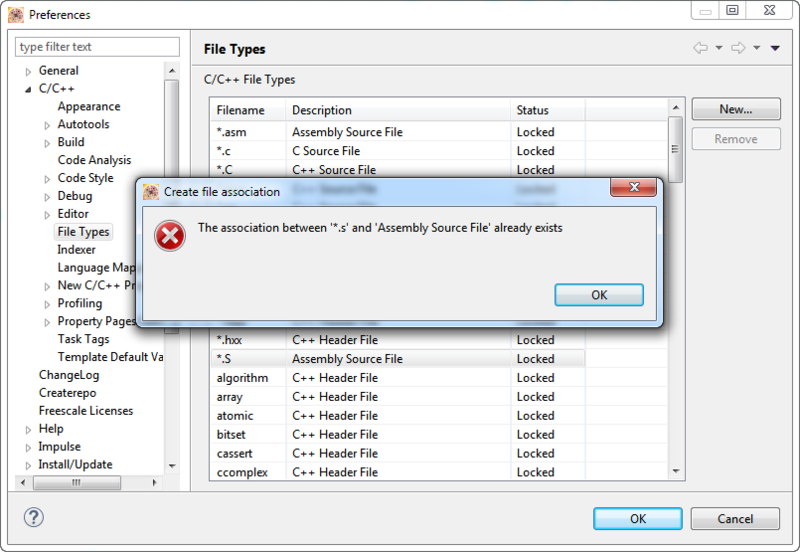 Well, that error message somehow does not make much sense, as there is no *.s association set. With *.s added, it now treats both *.S and *.s as assembly source files :-). 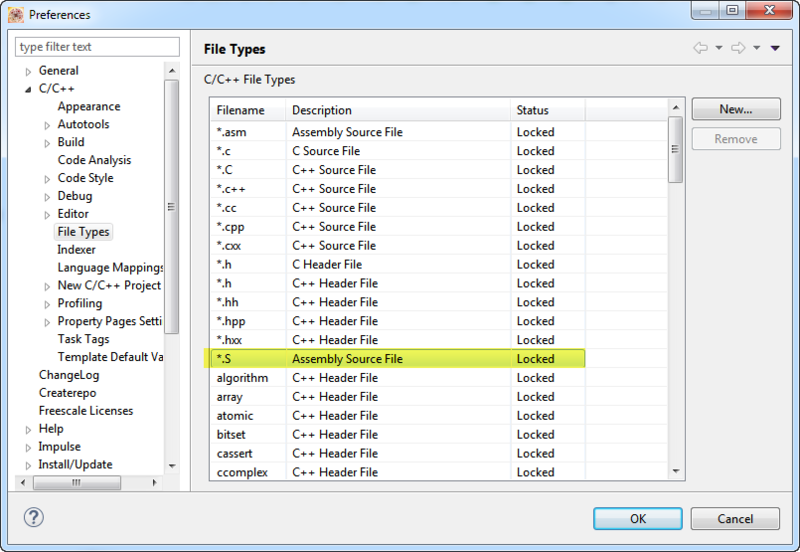 Because of an issue in Eclipse CDT (see links below), only *.S files are recognized as assembly files in the workspace settings. 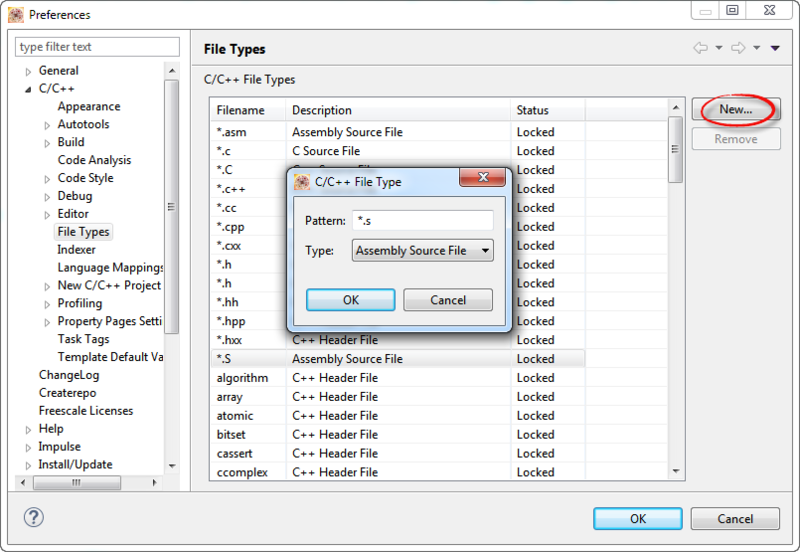 So I have to make sure that all my assembly files are using upper case *.S extensions, otherwise they are not treated as assembly files in Eclipse CDT. 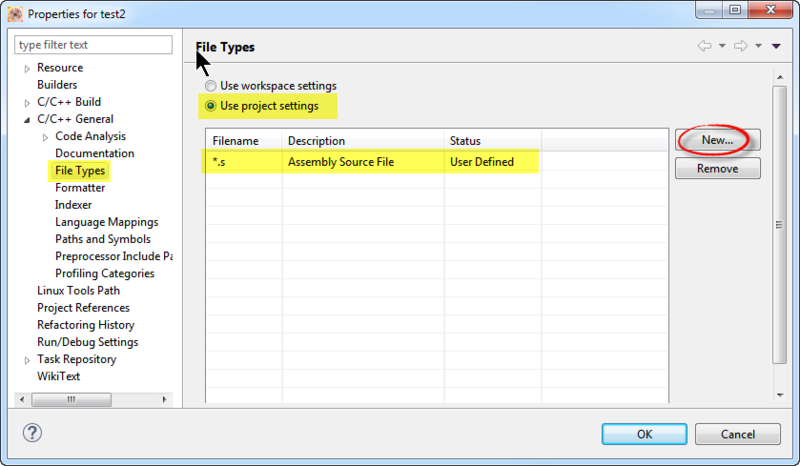 The only way to use *.s assembly files is to add a custom file type in the project settings. This entry was posted in Building, Eclipse, Embedded, gcc, Tips & Tricks and tagged arm gcc, Assembly, Building, CDT, Eclipse, Tips&Tricks, tool chains by Erich Styger. Bookmark the permalink. Yes – this is an annoying “feature” of CDT since as long as I can remember. Be aware though that traditionally *.S gets preprocessed and then assembled but *.s does not get preprocessed and just gets assembled. I’m not sure if CDT adheres to this convention? This may or may not be significant depending on the content of your files. But if you have a *.s file with preprocessor directives then I presume that it will just generate an error when the assembler is called assuming that CDT does not preprocess such files first. I did not know about the difference of preprocessing, thanks for that hint. Usually I stick to *.S because that’s easier and I don’t have to add custom file extension handling. Good point about using .asm instead, I have to keep that in mind for my new projects, thank you! We faced this problem when we added support for importing STM32 and TrueStudio projects; a lot of the STM32 online example projects use lower case s assembly file extension. This is fixed in our latest version of DRT; both upper and lower case s are supported.